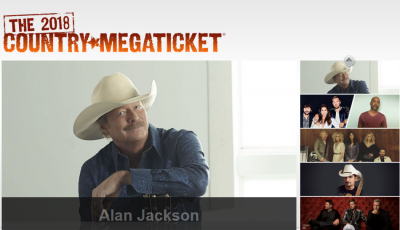 What Is the Country Megaticket and How Does It Work? You see listings for The Country Megaticket every time you look up your favorite artists’ tour dates, but at those prices, you KNOW it has to be a pretty big deal… but what is it exactly? Well, CountryMusicNewsBlog.com is here to answer just that! As the recession started to rise and our wallets started to empty, the country music industry was determined to find a way to keep it possible for their artists to tour and the fans to afford it, so they came up with a plan. The Country Megaticket: A series of major headliner concerts spreading over the course of the entire summer, all at one venue, and all for a one-time ticket purchase. You buy one Country Megaticket, and get admission to the entire concert series at that venue all summer long. This year we are excited to announce top performances from country music megastars Miranda Lambert, Luke Bryan, Kenny Chesney, and many MANY more! Country Music News Blog participates in advertising programs that help fund the operation of this site. For more information please visit our privacy statement. This entry was posted in Featured, Luke Bryan, Press Releases by Shauna "WhiskeyChick" Castorena. Bookmark the permalink.